JECA is a distinctly Christian school that teaches the liberal arts curriculum in an environment that promotes virtuous boyhood and girlhood. We post updates quite frequently on our Facebook page. We want to make it a great place to get some insight into what we are doing and why we are doing it. Come visit us on social media on Facebook (JECA) or the other social media outlets listed in icons at the bottom of each page. If you are a graduate of Pioneer Christian Academy, JECA is the curator of those permanent records. You may request a copy of your transcript (or employment verification) by emailing Office@JECANashville.org. Please include your name, birthdate, graduation date, maiden name (if applicable), and the name and address of where you would like your records forwarded. There is a $30 charge for this service which must be paid in advance (cash, credit, or PayPal). 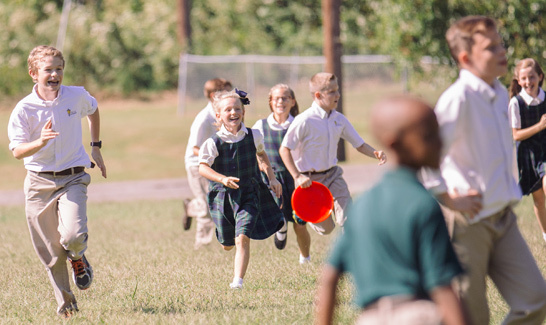 Jonathan Edwards Classical Academy is a classical, Christian school on the north side of Nashville, TN. JECA is committed to partnering with parents in educating their children in Christian wisdom, beauty, and virtue. JECA is a distinctly Christian school that teaches the liberal arts curriculum in an environment that promotes virtuous boyhood and girlhood.